If you know me this post might seem wildly inappropriate. Because, you see, my father died today. When I was a little girl in lieu of bedtime stories I would often ask for songs; it was an eclectic mix of show tunes, college drinking songs, and folk songs. Dad was a walking songbook, a reluctant entertainer who loved to entertain; he performed in a few community theater musicals and played piano at a ski lodge during college break to make money for drinks and lift tickets. In his last weeks, despite the pain and confusion, he managed to play the piano one last time, just the snippets of a tune, a familiar echo, a moment of hope. I’m not sure who will play the piano in the living room now that Dad is gone, but this one is for you. I wrote the rest of this months ago. It was a mighty fine sandwich. Here’s something to sing about. The Tetrazzini! 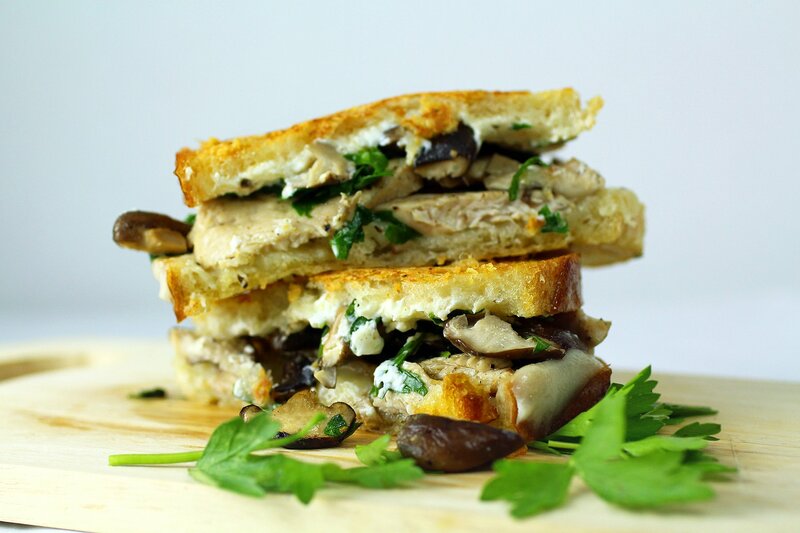 A spectacular trio of delicious cheeses perfectly balanced and piled high with mushrooms, turkey, and fresh herbs. Sourdough bread, tender soft on the inside, crisped with flavorful Parmesan on the outside. 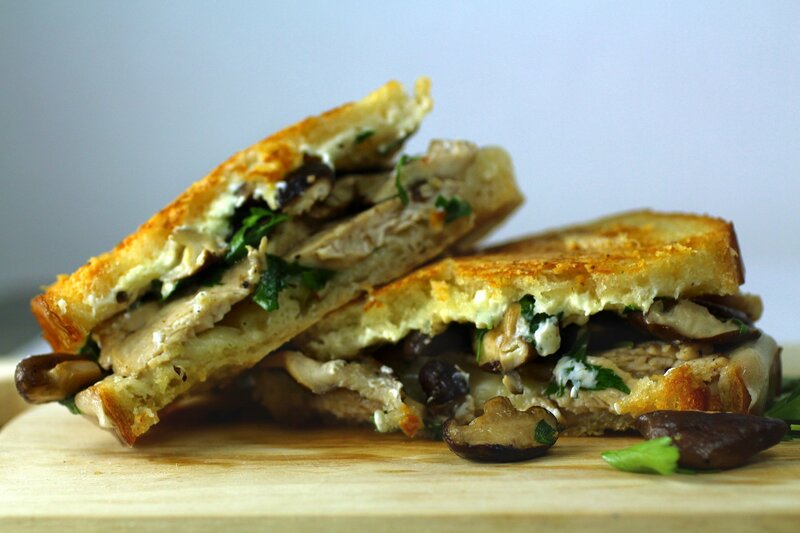 Earthy shiitake mushrooms sautéed with turkey breast Sherry Fino, and peppery arugula and parsley perfectly complements the warm Cream Cheese and deliciously tangy melted Provolone. Add the mushrooms to a preheated medium-sized dry skillet over medium low heat (well seasoned cast iron works best). Cook the mushrooms, stirring occasionally, until they have released most of their moisture and have just begun to brown, about ten minutes. Add a splash of oil to the pan and stir to combine with mushrooms and coat the pan. Push the mushrooms to one side and add the turkey slices and the dry sherry. Cover and simmer until turkey is cooked through, turning the turkey once. Remove the lid and cook for another two to three minutes or so until most of the liquids have cooked off. Remove from heat, add the parsley to the mushrooms and the arugula to the chicken, toss to coat and set aside. Spread a thin coat of mayonnaise on the outside of each slice of bread, spreading and pressing about a tablespoon of fresh grated Parmesan on top of the mayonnaise. Divide cream cheese and spread it on the inside of 4 bread slices. On the inside of the remaining 4 slices add one slice of the Provolone. On top of the provolone, layer 1/4 of the turkey and arugula mixture. Top the turkey with 1/4 of the mushrooms and parsley mixture. Brown the provolone side of the sandwiches on a preheated griddle pan or in skillet over medium low heat until the Parmesan side is golden brown and the provolone is just melted. Top each sandwich with remaining pieces of bread, cream cheese-side-down and mayonnaise/parmesan side up. Using a thin spatula carefully flip the sandwiches and continue to cook until bottom is browned and cheese is melted- about 4-6 minutes. Once browned, remove from heat and let sandwiches rest for about 1 minute before slicing in half to serve.